2018 is set to be a pivotal moment in Nottingham’s development as a thriving modern city, with several ambitious regeneration projects getting underway. Nottingham City Council has been driving forward its long-term vision for the city’s regeneration over recent years, with unprecedented investment in major schemes such as the expansion of the tram network, redevelopment of Nottingham Station, developing the Creative Quarter including the BioCity expansion and extensive housing developments and improvements to neighbourhoods. 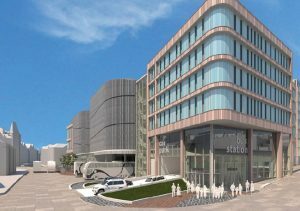 This will step up a gear over the next two years, as the council spearheads significant developments to the south of the city centre which will make it almost unrecognisable from how it looks today. Several regeneration projects – the intu Broadmarsh redevelopment, the new Broadmarsh car park and bus station, Nottingham Castle transformation and the new City Hub being undertaken by Nottingham College – will have a huge impact on the city landscape. 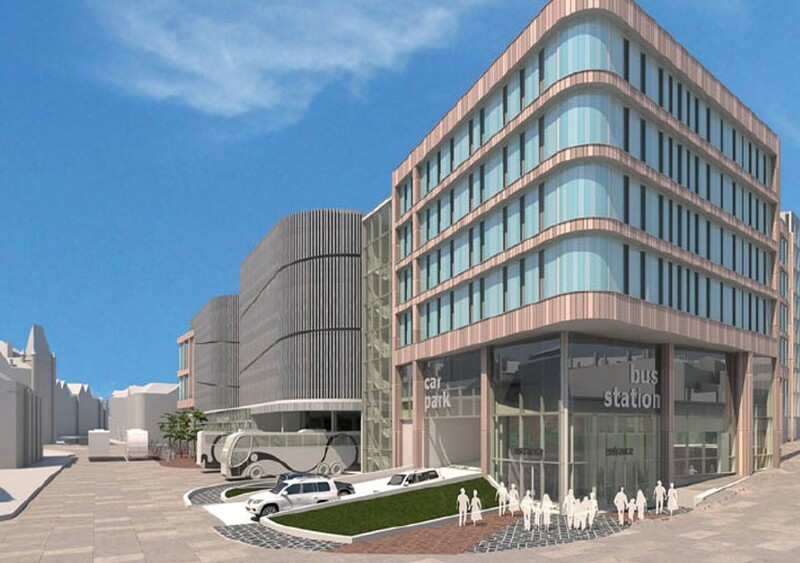 Along with substantial changes to the streets and public realm connecting these sites, this will create a modern and welcoming new entrance to Nottingham city centre from the south. Together these projects represent the most significant investment in the city since the completion of the new tramlines in 2015 in terms of scale, ambition and potential impact on growth. These large projects will create new jobs for local people, economic growth and help secure Nottingham’s future as a successful visitor and shopping destination. They are also helping generate positive buzz and momentum about Nottingham, which in itself is attracting new investors, developers and business to the city. Like all councils, Nottingham City Council is facing severe budget pressures, but recognises that strategic regeneration is critical for the ongoing prosperity of the city and its residents. As well as attracting private investment and external grants from the Local Enterprise Partnership and other sources, the council is investing in crucial projects like creating a better Broadmarsh – using no money from council tax payers but generating new income streams from the regenerated centre, car park and retail outlets. City Council Leader, Cllr Jon Collins, said: “It’s really important for the future prosperity of Nottingham that we remain ambitious and take decisions which are right for the city in the long-term. The City Council is behind the drive to make sure Nottingham is fit for the future, with lots of key schemes already delivered and a push this year to re-invent the southern part of the city centre – all of which will bring new business, jobs and amenities for local people. 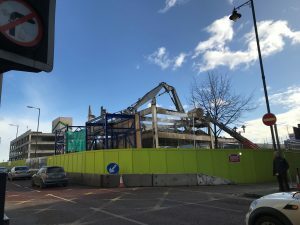 “The schemes getting underway this year will make the whole area around Broadmarsh virtually unrecognisable from how it is today. New vehicle routes will remove or reduce traffic from around these new developments, making it a much more attractive and pleasant part of the city for people to enjoy. It’s been a long time coming, but work is well underway, and the complete makeover of the Broadmarsh area will bring new life and vitality to the city centre. The £250m transformation of the area is more than just the redevelopment of intu Broadmarsh – it includes a new modern car park and bus station; road layout changes for better pedestrian environments; new City Hub college building and the Nottingham Castle transformation. These developments are expected to boost the local economy by over £1.1 billion per decade, create nearly 3,000 jobs for local people and attract an extra three million people a year to the city. The new £58million City Hub for Nottingham College near the revamped Broadmarsh on unused land off Canal Street will provide traqnsformed facilities for 20,000 city students, and link them more closely than ever before with local employers. Expected to open in autumn 2020, it will also host a business hub to encourage the formation of new start-ups, and will provide the wider community with improved training and skills resources. The modern new college will house a performing arts centre, student retail space, café, community facilities, training restaurant and bar – and the grounds will create a brand new green space close to the city centre. The £30million Nottingham Castle project, funded by the Heritage Lottery Fund, Nottingham City Council and donations, will re-establish Nottingham Castle as a focal point for civic pride and create a world-class cultural destination at the heart of a regenerated Castle Quarter. The regeneration project will bring the Castle’s medieval past into plain sight, and offer plenty of Robin Hood for tourists and locals. Brand new upgrades to the galleries will mean bigger, better exhibitions coming to Nottingham; other new features include a new visitor centre. Nottingham Castle closes this spring to allow the works to begin. The revamped Nottingham Castle is due to open its doors to visitors in 2020.